If you’re one of those people who think that adjustable beds are only for those that are old or unhealthy, it’s time to adjust your thinking. Reduction in back and joint pain – By supporting your neck and spine in correct positions, an adjustable bed relieves the pressure that many experience from flat beds. Find your best position by either raising the neck and head, or the feet, or a combination of both. Relief from heartburn or indigestion – Those suffering from acid reflux can reduce the amount of rising acids by elevating the upper body by about 6 or 8 inches. When acid is kept from traveling up the esophagus, a less-disrupted sleep is possible. Improved respiratory function – By alleviating pressure on the lungs, those who suffer from ailments such as asthma, bronchitis or COPD are able to enjoy more uninterrupted periods of deep sleep. Adjustable bases also help with cold and flu sufferers. 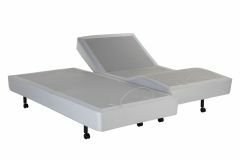 Reduction in arthritis symptoms – For those whom arthritis in the neck or spine is an issue, adjustable beds relieve the joint compression that contributes to recurring pain. Sleeping at an angle that alleviates that pressure helps lessen pain throughout the day. This short list is just some of the sleep advantages experienced by those with an adjustable bed. As Newington’s Top-Rated Local® mattress store, our total focus is your best sleep experience. Please visit our mattress showroom today and experience Leggett & Platt adjustable bases for yourself.